« Mmmmm, literature . 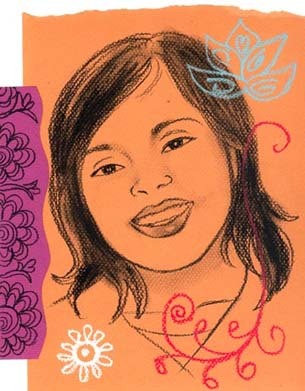 . .
1* When we asked for a picture to go with this interview, she sent us this lovely portrait by Jamie Hogan, illustrator of her recent middle-grade novel Rickshaw Girl. Aw. Pretty. 2* Her website. Mitali’s Fire Escape is chock full of resources like booklists, contests, and frequent updates about public appearances and interviews. It also has a fabulous new look, thanks to the excellent web stylings of Little Willow. 4* …and an ongoing series of posts called “Why I Write For Children,” which deserves its very own mention. 5* Her other blog. Well, actually, that of her character Sameera from First Daughter: Extreme American Makeover. Sameera, aka Sparrow, is the adopted daughter of a presidential candidate, so she posts about the current crop of “first kid wannabes and their parents.” She’s also on MySpace and Facebook. For a fictional character, she’s awfully prolific. 6* She really is as nice in person as you’d think she is from her blog. I got to meet her at Charlesbridge’s Open House a few weeks ago, and she was utterly charming and gracious and funny. And she’s an engaging public speaker, too. 7* Most of all, her books. 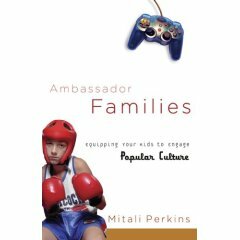 Mitali writes about kids “between cultures” – i.e., kids who are struggling with a cultural identity, having been born and/or raised in a different culture from their parents – with all the empathy and candor of someone who has been there herself, and wants to reach out to the next generation. 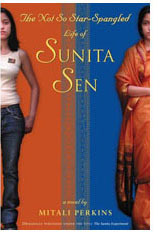 The Sunita Experiment (1993, Little, Brown) was reissued as The Not-So-Star-Spangled Life of Sunita Sen in 2005. It’s about an 8th grade girl, born in Kolkatta but mostly raised in California, whose world is turned upside down when her grandparents come from India to visit for a year. Suddenly her mom has switched over to traditional Indian dress and making Indian food… and suddenly she’s not supposed to hang out with boys, including her serious crush Michael. Sunni has to figure out a way to find a balance between being honest about her heritage, respectful of her family, and true to her all-American self. Monsoon Summer (2004, Delacorte) features another strong heroine coming to terms with her identity in her own way. 15-year-old Jasmine is not at all thrilled about having to leave her prospering souvenir-photo business and best-friend-but-wish-he’d-be-more behind in Berkeley for an entire summer, but her philanthropist mother is insisting that Jazz accompany her to volunteer at an Indian orphanage – during monsoon season. Through her friendship with a girl at the orphanage, Jazz – who has never felt entirely comfortable in her own skin – grows into a new acceptance of her own strengths and a new perspective on her heritage. With 2007’s Rickshaw Girl (Charlesbridge), Mitali gives us a glimpse at the emerging role of women as business-owners in modern Bangladesh. 10-year-old Naima longs for a way to help her family earn money, since her father barely pulls in enough from driving his rickshaw to make ends meet. As a girl, though, her options are extremely limited. Through an unfortunate accident, she discovers a way to put her talent for alpana-painting to use – as an assistant in a rickshaw repair shop. This excellent story is evocatively illustrated by the talented Jamie Hogan. And then there’s Mitali’s newest novel, First Daughter: Extreme American Makeover (2007, Dutton), the first in a series about Sameera Righton, the adopted Indian daughter of a Caucasian couple – whose father happens to be running for president. She gets a bit of an identity crisis when his PR peeps decide to give her a makeover to make her seem more American, and make her father seem more electable. She’s even written a non-fiction book for adults: Ambassador Families: Equipping Your Kids to Engage Popular Culture (2005, Brazos) offers advice on raising Christian children in peaceful coexistence with our media-blitzed society. Coming soon: Asha Means Hope (Delacorte, 2008), a YA novel about a 14-year-old girl with family secrets, and The Bamboo People (Charlesbridge), a novel about two boys caught in the Karenni/Burmese conflict. Also, First Daughter: White House Rules is due out in 2008! You’re probably wondering when this woman sleeps. Unfortunately, I didn’t think to ask that. But she does have all kinds of thoughtful and entertaining things to say about the Sunita reissue, book touring with her mom, and what curse words a preacher’s wife is likely to say in front of her twin sons… so, on to the interview. 7-Imp: You recently returned to your old Queens stomping grounds on a visit to a middle school. How did it go? Mitali: I was overwhelmed by the preparation, hospitality, and excitement accompanying my event at MS 217. The school hadn’t had an author visit in 10 years. When I asked the audience to raise their hands if they were born in another country, EVERY hand came up. Brought back so many memories of a little no-less-dorky version of me reading and writing and dreaming all those years ago. 7-Imp: You’ve spoken at length on your website, in lectures, and in interviews about the need for books that address the issues of kids “between cultures.” Explain a little about what that term means to you, and why you’ve made it a personal mission to create resources that meet those needs. Mitali: Living between cultures means that you don’t feel like you fit either in your community of origin or in mainstream Americana. It means that you’d better learn to flex your spirit so that you can eventually feel at home in many places or that you’ll spend a bulk of your formative years feeling disenfranchised. Through stories, immigrant, adopted, and bi-racial kids can achieve the flexibility needed to survive life between cultures, as well as to make themselves feel at home. That’s why I created the Fire Escape, my contests, and my lists of great reads. 7-Imp: Is there a particular character or situation in any of your books that most closely resembles your own struggle to find a balance between two cultures? Mitali: Probably Sunita in The Not-So-Star-Spangled Life of Sunita Sen (Little Brown), who plays tennis and lives in the California burbs like I used to. Her grandparents come from India to visit her just as mine did. And in one of the many editions of the novel (paperback Hyperion version), the guy they put on the cover eerily resembled my major middle school crush. 7-Imp: What was the collaboration process with Jamie Hogan like for the lovely illustrations in Rickshaw Girl? 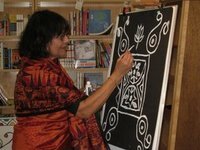 Mitali: Susan Sherman, Charlesbridge’s genius art director, selected Jamie after considering several artists, and asked me to send any books about rickshaws, photos of Bangladesh, and real-life alpanas (Bangladeshi folk art). When our family got together over the holidays in California, Mom quickly sketched a few alpanas as she sat by the pool watching her grandkids swim. Jamie took all of that stuff and came up with her own brilliant, beautiful, black and white pastels. When Susan and Judy O’Malley (editor) invited me to come in and check out the art, I got all choked up seeing Naima come to life through Jamie’s gift. I did have a couple of cultural corrections related to earrings, bangles, and pillows, all of which Jamie incorporated. She and I finally met at the NESCBWI conference last year, after which she painted this portrait of me [above], and in her typically generous way, sent to me as a gift. 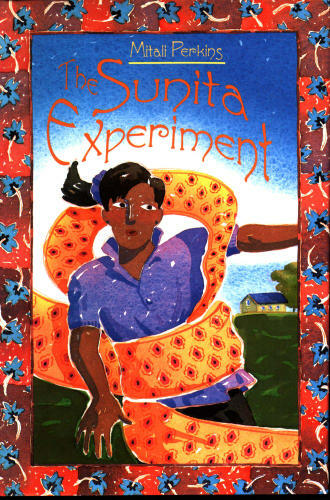 7-Imp: Tell us about the reasons for the changes you made between the original release of The Sunita Experiment, and its second incarnation as The Not-So-Star-Spangled Life of Sunita Sen.
Mitali: One of my pet peeves is any “exoticization” of Asian women by the media. I went on long and boring tirades against it — something one should never do before making sure one will not commit that particular blunder oneself. Which I proceeded to do, and badly. How so, you might ask? Well, here goes. I wrote the first edition of Sunita’s story when I was young, got it published fast, and received widespread wonderful reviews — except for one. This particular reviewer said the book was fine except for the ending, which unnecessarily “exoticized” the main character. “WHAT IS SHE TALKING ABOUT?! ?” I yelled. “I’m sure, Michael,” she tells him, giving him one of her trademark smiles just to prove it. HOLY BLUNDERS, BATMAN! I HAD DONE THE DEED MYSELF!!!!! What a lesson! A good dose of humiliation is a superb teacher, as is maturity and experience. Thank heavens, too, for the grace of a re-issue. 7-Imp: What was it like to do a mini-book tour with your mom? What’s your family’s reaction to what you do? Mitali: Joy! Mom rocked, as I knew she would! She once won the California Teacher of the Year award, and kids can always sense that she (a) loves them, (b) believes in freedom of expression in creating art, and (c) will be more than able to keep the peace. As for the clan’s reaction, there’s an aura of astonishment (shared by me) that my lifelong story addiction actually turned into a rewarding vocation. The parental pride in the Bose household borders on insanity, and my 80-year-old father has mastered googling, downloading attachments, and surfing the web in order to track my career. 7-Imp: Sameera seems to be doing quite well over at her own blog. Why did you want to give her an online presence of her own, and how much fun/work is it turning out to be? Mitali: Sameera came alive to me while writing the books and I didn’t want to say good-bye to her voice. I also love politics; I studied it in college and grad school so I thought a blog focusing on First Kid wannabes would be an interesting way to track the ’08 campaign as well as a chance to market the books. It’s turning out to be so much fun! I think of Sparrow’s blog as a savvy mini-Wonkette for teens, but providing safety and courtesy to all the presidential candidates’ kids is a huge priority for Sameera (not so for Wonkette, which is all juiciness and scandal). 7-Imp: What’s in heavy rotation on your stereo/ipod lately? How about Sameera – what’s she listening to? Mitali: After moving to Boston six years ago, I morphed into a country music fan. I have no idea why. Perhaps the songs provide the sense of place I’m still craving, or maybe because essentially I’m still a jute farmer’s daughter from the countryside of Bengal. So, if you hit random play on my ipod, you’ll get a strange combo of Rascal Flatts and Little Big Town, old-school Motown hits from the seventies like Al Green’s “Let’s Stay Together” (all-time great love song), hymns sung by Fernando Ortega, and some classic Bengali Rabindranath Tagore songs that my Mom used to sing. Sparrow’s a mix, too, like me, so she’s listening to a bunch of Bollywood songs, country, and R&B; she likes Carrie Underwood, Chris Brown, and Disney movie soundtracks. 7-Imp: What’s one thing not many people know about you? Mitali: I was the fattest baby ever born in Shebashodon General Hospital in Kolkata, India (I made local news headlines), mostly because I didn’t want to come out in a hurry. Why did I dawdle in the womb? Well, as a third daughter, I probably realized that the revelation of my gender would make the entire family weep. Which it did. Mitali: Q. How have you surprised yourself in the writing vocation? A. By becoming a cyber-geek and enjoying it. Here’s what I’m glad they don’t ask: Mitali, how often do you check your Fire Escape visitor stats or fiddle with html coding? The answer is way too embarrassing. 7-Imp: What turns you on creatively, spiritually, or emotionally? Mitali: Time alone in a retreat center by the sea where non-invasive hosts provide silence, space, Darjeeling tea, homemade scones, maps of walking routes, and a shower with amazing water pressure. Mitali: Too much time on the internet. Mitali: I appreciate flavorful words, and never mind when other people employ them to express emotion. To answer this question, I asked my teens what they’ve overheard me mutter under duress, and they came up with “stoopididyot” (on the road) and “yiggies” (in frustration). Pathetic. My boys obviously haven’t heard the furious words in English and Bangla that I’ve hurled Godwards in times of pain, doubt, fear, sorrow. Mitali: My sons laughing with their buddies. Mitali: Chef. I stink at cooking. I’ve just burned some frozen pizza while doing this interview. This is exactly how my parents greet me each time I come bursting through their front door. June 18th with Kelly at Big A little a.
June 20th with Vivian at HipWriterMama. RSVP as space is limited. Mitali’s short stories are linked on her website. Ambassador Families – her parenting blog. “A Note to Young Immigrants” – article in Teachers.net Gazette, May 2003. “Ladies of Calcutta” – interview by Sandip Roy in Telegraph – Calcutta, September 5, 2004. “Notes to the Zero Generation” – article in Hatchette Book Group Author’s Lounge, undated. “Interview with Mitali Perkins” – by Kelly Herold in The Edge of the Forest, May 2006. 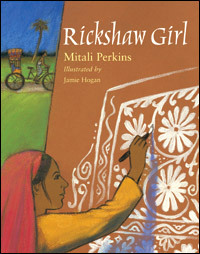 “Interview with Author Mitali Perkins” – by Laura Atkins at PaperTigers.org, 2006. And tune in tomorrow for our interview with Holly Black! I’m sold! 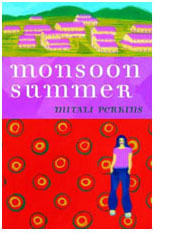 Mitali Perkins has been on my “to read” list (and I even started Monsoon Summer and had gotten into it before I just got overwhelmed with life at that particular time). I agree with Perkins about hating to hear “Okay, you’re all done now” from a massage therapist. It makes me feel so serviced, and of course I want to be special. Oh, her message from God makes me cry. “Are you here, my darling?” How lovely that her parents say that to her. Actually, all of her books make me cry thus far. (Haven’t read the non-fic or the two newest, but just let me get there!) I have read her blog and her books and it still doesn’t get old, the cross-cultures thing. I think that’s exceptionally cool, and this is a great interview! Wow. When I think about the work it took to link all this stuff to the right places. Thanks, J and E. As I said to you in my email, this is probably the most comprehensive all-Mitali place on the planet outside of my parents’ brains. Guess what? Sameera got a comment from Elizabeth Edwards (yes, the First Lady wannabe) on http://www.sparrowblog.com today and her site stats are going nuts with links from Time/CNN and everything. Could be a first for a fictional character. I wanted to say: I LOVE THAT ILLUSTRATION OF YOU, and as I told you already, I never want to post ever again so that that gorgeous image can stay at the top of our blog forever. Jamie Hogan, that is just beautiful! That’s great news, Mitali and Sparrow (re: Elizabeth) You deserve it! Go Mitali! Go Sparrow! Jules and Eisha, I put up Mr. Linky so people can link in their favorite posts. I’m quite curious what you gals would choose! Hope you stop by. And congrats, Mitali and Sameera. And thanks for the interview! And thanks to everyone else for dropping by. Akelda – “serviced” made me snort. TadMack – I agree, it never gets old. Kelly – mortals? C’mon, now… we’re just librarians. We get a little happy with the references and stuff. Only wanna input on few general things, The website design is perfect, the subject matter is real superb : D.